At last, connox.com is now also available as app! Furnishing your apartment was never so easy. 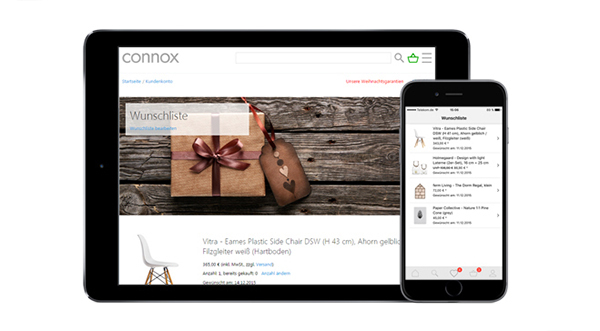 With the Connox decoration and furniture app we provide convenient browsing, getting information and mobile shopping on the way out - as if you had the best designs with you at any time. Access the Connox home design shop directly with the ConnoxApp. Get product recommendations that suit you. What makes it especially convenient to shop via ConnoxApp? You have our shop directly on your smartphone. You don’t need to enter an URL, log in and off again or switch the devices to get in contact with us or to get your order email. All of your activities within the app synchronize automatically with all other devices on which you call connox.de. What makes shopping via the app so efficient? Use the time slots of your life! Via the ConnoxApp you can access our assortment directly and quickly - on the train, in the queue, at the cash register or at home in front of the TV. At any time you can interrupt your research or shopping at Connox and put on again at a different time, exactly where you left off. 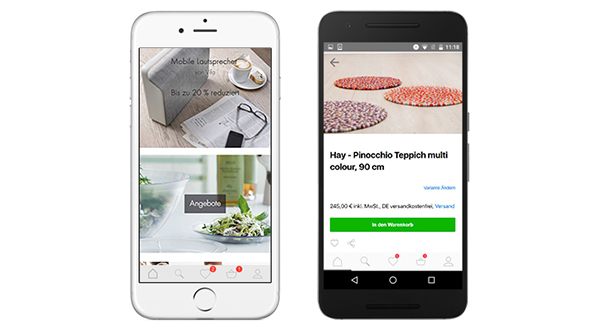 What makes mobile shopping so exciting? On the home screen every day agian new design products, latest offers and trend products await you. This way, be the first who learns about innovations and design trends! Arranging your home via app - an experience not to be missed! The ConnoxApp is available for both the iPhone and Android devices. Get the free decoration and furniture Connox app directly on your smartphone! Download now in the App Store! And because nobody - and no app - is perfect, your feedback is important to us. Any comment from you helps us to improve our app and your shopping experience. We're working on it every day. Therefore: You send us your opinion, wishes, suggestions - to service@connox.com. Further information is available on our help page to the ConnoxApp. If you have any questions, please contact us - via phone at +49 511 300341-0 or via email at service@connox.com. Enjoy the furnishing and arranging your home with the app!